Carlos, Frank, Kevin and I saw The Friends of Eddie Coyle (1973) at the Somerville Theatre in Somerville, MA, a historic building in the middle of Davis Square. Built in 1914, it first started off as a theater for plays, vaudeville and other shows but since the advent of motion pictures it added films to its repertoire. 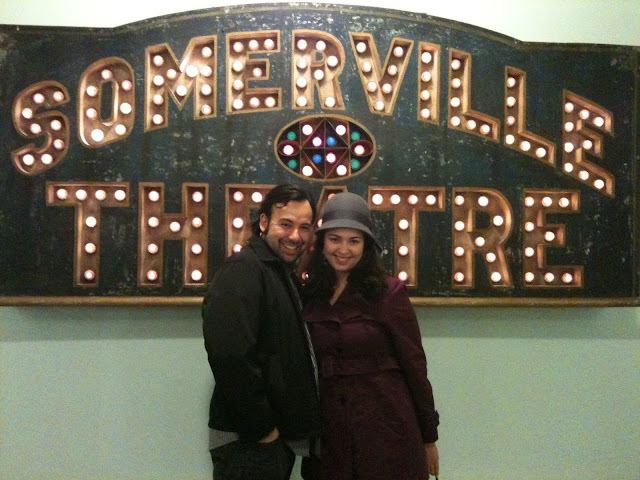 Today, the Somerville theatre showcases contemporary films, live musical performances and fun shows like the annual Slutcracker (oh yes, Carlos and I went to that. Two years in a row!). What the Somerville Theatre doesn't often show is classic films. So when they announced on their Facebook page that they would be showing an archival print of The Friends of Eddie Coyle (1973) in March, this Robert Mitchum loving gal was so excited. The Friends of Eddie Coyle is a quiet crime caper. And no that is not an oxymoron. It takes place in my beloved Boston and it centers around criminals and detectives connected with Eddie Coyle (Robert Mitchum). While there are some action scenes, it's a quiet movie that focuses more on interpersonal relationships between the other characters and Eddie Coyle and the plot escalates as Coyle gets himself into deeper and deeper trouble. Coyle is an ex-con who just got out of prison but faces more jail time in New Hampshire for helping a guy from Burlington, MA smuggle some booze over state lines. He's trying to earn a lot money to get his family out of Quincy, MA and to Florida so they can live new lives and leave Coyle's criminal past behind. He simultaneously tries to make a bargain with local police detective Dave Foley (Richard Jordan) to get himself out of the NH jail time while also buying guns from a gun runner to help out a gang of robbers pull off various bank heists. Coyle thinks he's got it all figured out but there are way too many hands in the pot and things become very complicated. The film was directed by Peter Yates and also co-stars Peter Boyle. It inspired much of The Town (2010). Filmed in the Boston area, one of the novelties for myself and for other Bostonians is seeing all the 70s era version of our favorite Boston locations. Or seeing some long gone sites. I don't want to go into this film in too much detail because I still have a dream of writing a more in depth homage. So instead, I wanted to share some pictures of our outing to see this film on the big screen. Special thank you to Carlos, Frank and Kevin for joining me in this adventure. 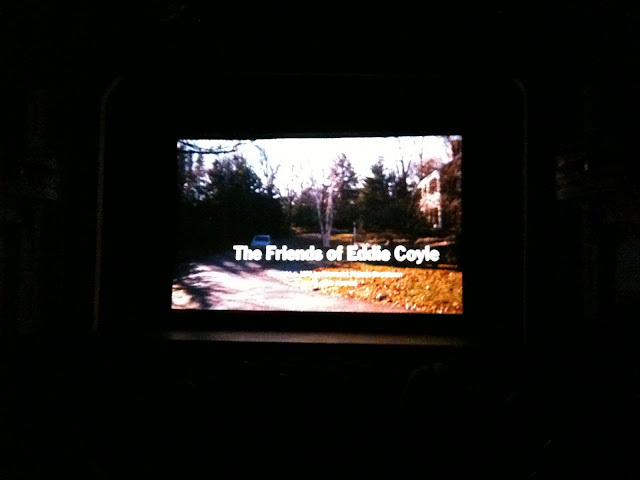 The Friends of Eddie Coyle on the Somerville Theatre Marquee. If you look closely, I'm on the far right looking up at the marquee. 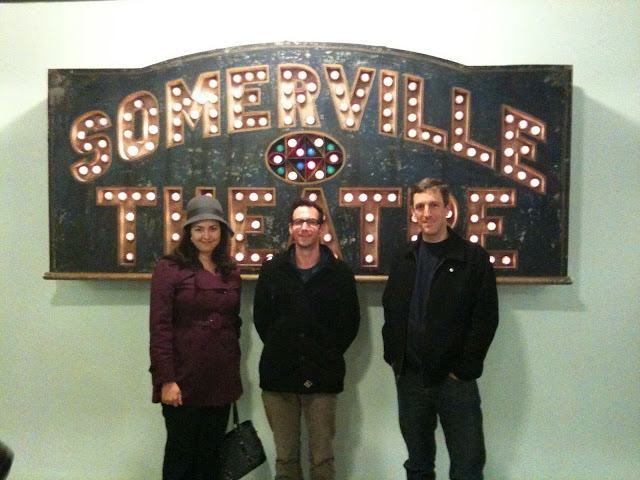 Here is Frank in front of the Somerville Theatre sign in the lobby. Somerville Theatre serves beer and wine. Here's my cup o' beer and my cloche hat. 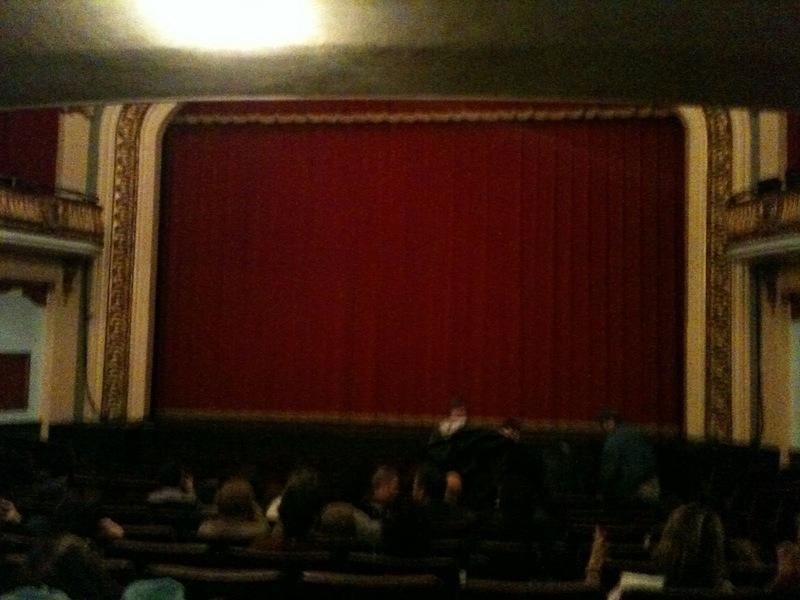 This is the inside of the Somerville Theatre. 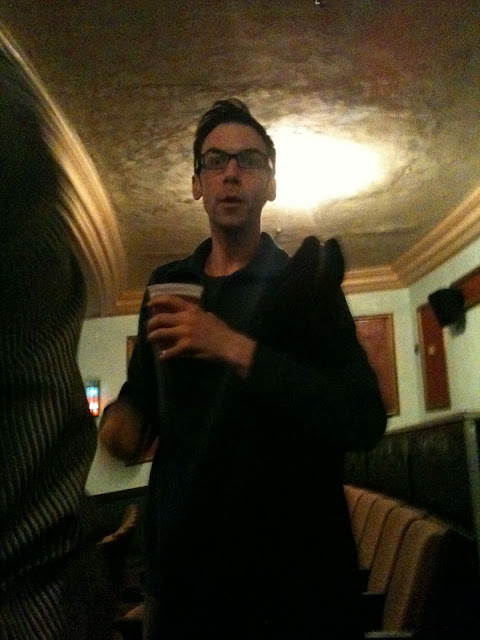 An action shot of Kevin with his beer getting ready to enjoy the movie. 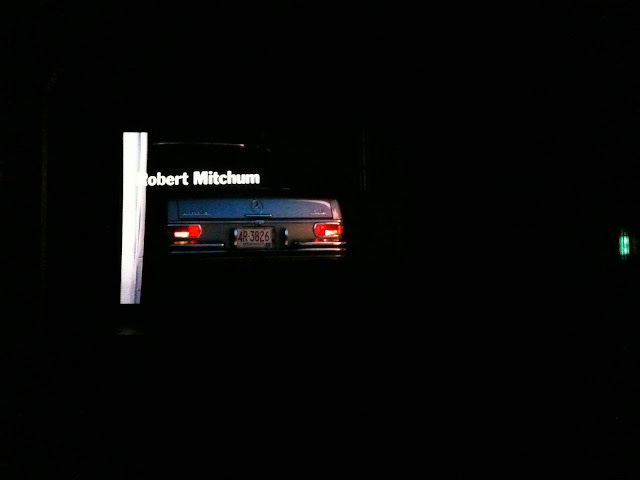 Had to get a shot of the film name in the Title Sequence. Fo sho! I almost missed this shot because some lady wanted to sit right in front of me. No one, and I mean NO ONE gets in the way of me and Robert Mitchum. Some more shots in front of the sign. Me, Kevin and Frank. Ah I missed this when Somerville showed it and now I'm regretting it after reading your thoughts! It's always interesting to see films shot in Boston, and I'm not sure I've ever seen one from the 70's since I moved here. I'll have to catch it on dvd. Great photos, too. The Somerville Theatre is so great! I was just there yesterday for Robocop/Terminator. Hey Alex - Frank & Carlos were at the Somerville Theatre yesterday for Terminator! I wonder if all of you went for the same showing. You should really check out the film. It's great and the Criterion Collection released an edition of it last year! Oh cool! I think there was only one showing of each film yesterday so it must have been the same one! It was a lot of fun to see both movies on a big screen, though I was surprised a lot of people didn't stay for The Terminator. And yes a few months ago my boyfriend rented the Criterion release of The Friends of Eddie Coyle but watched it without me! I will get a copy for myself, surely. Also, a fellow by the name of Bill Doncaster, is adapting the novel, The Friends of Eddie Coyle into a stage play in the Boston area. He had a very successful reading at the Burren last November. Lastly, another Boston based caper, "Cogan's Trade", a novel written by Coyle author, George V. Higgins, is being adapted and is shooting in New Orleans right now..starring Brad Pitt. It was another low-level crime story with a lot of great dialogue that was featured in The Friends of Eddie Coyle. Should be out next March. Hope you like our tribute and keep up the great work on this blog....good stuff! When I would walk down from Tufts to the Somerville Theater on weeknights, to avoid doing my homework mid-60s, it was still an old-fashioned movie house. Wednesday nights, you got a free plate or bowl with each admission. I love this! I hope you don't mind if I post a hyper-link to this particular page of your blog from mine. This is one of my fave movies. Thanks for sharing these pics. (Please pardon if this comment shows up a dozen times, I'm having trouble with your Captcha/security verification process).